Regulation of greenhouse gas emissions, including caps and prices, is spreading around the world. Jurisdictions without something in place are becoming the exception. Back in January I noted that carbon pricing is in place or legislated in jurisdictions accounting for around a quarter of the world’s CO2 emissions from energy and industry (with typically around half of emissions in these jurisdictions being priced). This is a huge increase from ten years ago, just before the introduction of the EUETS, when the corresponding figure was less than 1%. But this trend is now set to go much further as limits on carbon emissions spread nationally in China and the USA. A national emissions trading scheme in China is expected before the end of this decade, following on from the provincial trial schemes already established. (In practice such a scheme may be phased in over a few years.) EPA regulation in the USA will introduce caps on emissions from the power sector to take effect from 2020. These measures will mean that jurisdictions accounting for around two thirds of emissions will have some sort of cap or pricing in place. (EPA regulation will be implemented at a state level. It is likely to involve carbon pricing in some cases, although some states may pursue a more direct regulatory approach. In either case emissions will be capped.) This will have been achieved in only about a decade and a half. 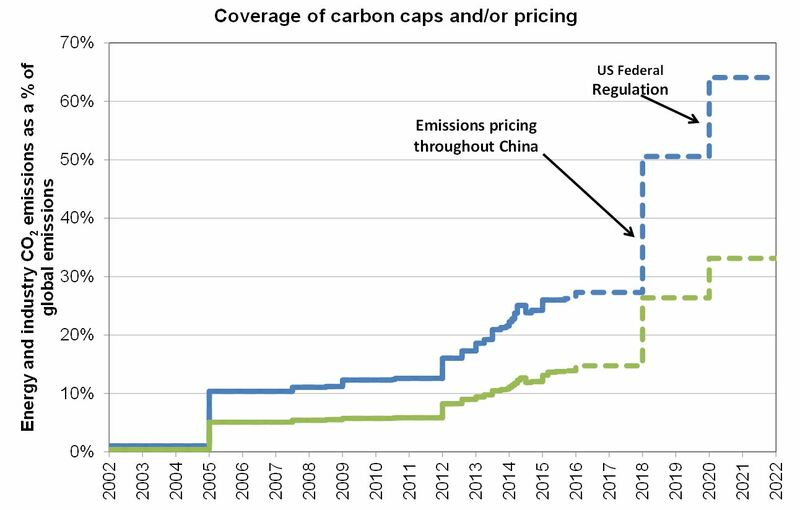 With measures in place across the EU, the USA, and China, carbon caps and pricing will have become the norm rather than the exception. This is likely to put pressure on other jurisdictions without such measures to act. This trend is likely to be reinforced by agreement at the UNFCCC conference in Paris next year, even if, as expected, any agreement there stops short of legally binding emissions reduction targets. The blue line represents the proportion of global emissions of CO2 from energy and industry occurring in jurisdictions with carbon pricing (i.e. excluding other sources of CO2 such as deforestation, and other greenhouse gases). The green line represents the proportion of emissions actually priced, which is typically about half the total, because some sectors are usually excluded from pricing. Looking at broader climate legislation, including not just carbon pricing but also other measures aimed at emissions reduction or adaptation to climate change, a similar pattern of rapid growth is evident. 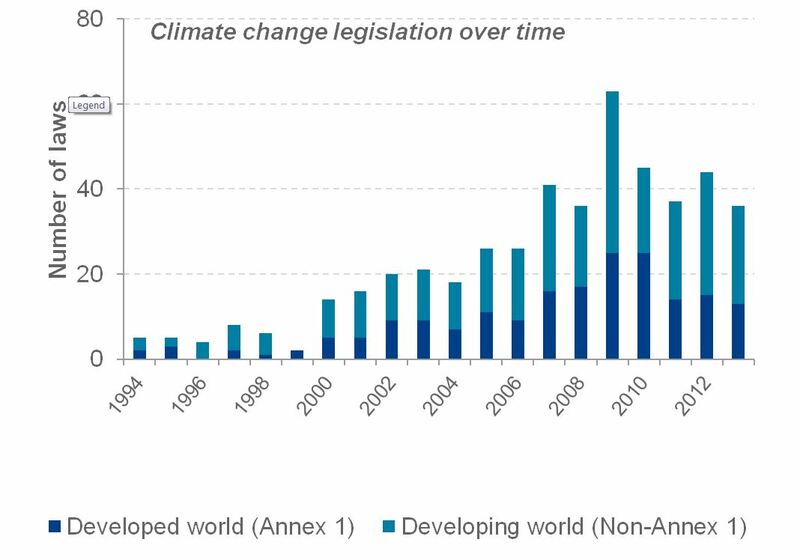 The number of pieces of climate legislation introduced in the last ten years was nearly four times that in the previous ten years. And legislation has been introduced in both developed and developing countries. There are, of course, many reasons to remain cautious about progress. The outlook national scheme in China remains uncertain in the timing of its introduction (here assumed to be 2018), its stringency and its effectiveness. US EPA regulation remains subject to legal challenge, although it seems likely to survive this. Prices in the EUETS remain low. And, even with all the present and prospective schemes in place, emissions reductions goals still fall short of what’s necessary to have a good chance of meeting the international commitment to limit the rise in average temperatures to 2 degrees (a goal which now looks extremely challenging in any case). But there has been tremendous progress in a relatively short space of time. Discussions on climate policy needs to recognise this context. Any claims along the lines that either that “no-one’s doing anything” or “we’re the only ones doing something” are no longer valid. There remains a pressing need to enhance this world-wide momentum, so that global emissions can peak and begin their ever more necessary downward track. But acknowledging that should not obscure the remarkable progress that has been made. The spread of caps across the USA is shown as a single step on the above chart. However the form of implementation of limits will in practice vary between states. The caps under section 111(d) of the clean air act proposed by the EPA in the US are currently intensity based, with the conversion to mass based standards a matter of continuing discussion. Implementation as the state level will vary, and it is likely that it will include pricing in some cases by not others. Some states may join the Regional Greenhouse Gas Imitative (RGGI), others may include some kind of flexibility that in effect creates a carbon price in one state, or in a group, while others may pursue a more direct regulation of individual plants. Japan and Mexico, which were deliberately excluded from the chart I posted in January as they have very low prices. However they are included here. The intention here is to give an indication of all the jurisdictions with action in some form. 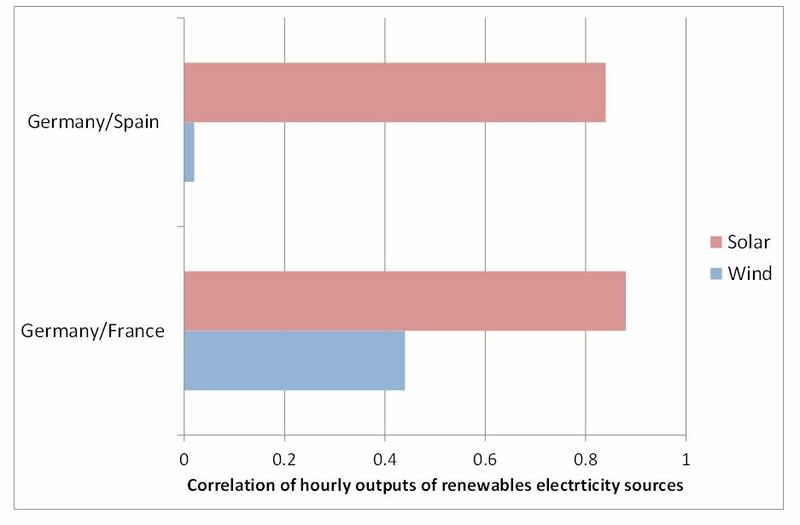 This entry was posted in Climate change policy on 30/09/2014 by adamwhitmore.